You just can't have a Festival celebration without oil lamps, and if you want to make the holiday a success, the Handmade Indian Brass Oil Lamp with Kuber on Tortoise is the perfect thing to place upon your altar or table. This oil lamp was made the traditional way and brings a touch of India to Festivals! 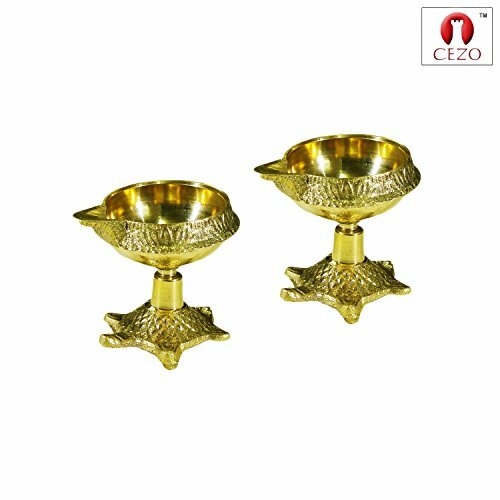 The Handmade Indian Brass Oil Lamp with Kuber on Tortoise is a traditional oil lamp known as a diya. Used since ancient times as a decoration and a source of light, the diya is an oil lamp that burns vegetable oil or ghee Indian butter. Once the lamp is filled, you place a cotton wick inside and light it to fill the room with light. The lamps are used as a part of Festivals, but you do not need to be Hindu to enjoy them. You can also use them as decorations in your home in the living room or bedroom or place them on a dining table instead of candles. The Handmade Indian Brass Oil Lamp with Kuber on Tortoise is fully artisan crafted in India, making it a truly authentic diya. The brass craftsmanship allows the oil lamp to be filled and used again and again, and the design of the diya with Kuber on Tortoise makes it as safe as possible. Plus, there are feet at the front to keep the diya stable to avoid spilled oil. Even when unlit, the Handmade Indian Brass Oil Lamp with Kuber on Tortoise is a gorgeous addition to the decor of any room. Because the lamp is made from solid brass, it has a warm golden glow that is simply breathtaking. Complete the decor for your Festival celebration in the utmost of style or add some Indian flair to your dinner party or living room decor. Order the Handmade Indian Brass Oil Lamp with Kuber on Tortoise today! If you have any questions about this product by CEZO, contact us by completing and submitting the form below. If you are looking for a specif part number, please include it with your message.